There’s a whole bunch of add-ons already for this such as Playstation 2, PinBall FX 2 , Naomi and more! Q: What are the minimum system requirements? A: Not much! Windows Vista or newer, Microsoft Visual C++ 2015 Redistributable (x86), DirectX 9. Q: It’s not working! Where can I get help? A: The basic software that needs to be installed is in the folder ‘- Fixes for CFW not working!!!’. Install ‘vc_redist.x86.exe’ if CFW will not open and ‘/DirectX 9/DXSETUP.exe’ if the games will not open . Q: What is the difference between the Gems and Packed Editions? A: Gems has the fewest games, then Gems Plus then Packed has the most. Gems and Gems Plus are designed to be a single layer of mixed games/consoles with the focus on arcades with some console classics. Gems Plus has a lot more games than Gems, but is built with the same structure. Packed is separated by consoles and has a ton of games for many different systems. The idea with Gems is quality over quantity. Q: Can I talk to the CFW developers and the community? Can I make requests for future versions of CFW? A: Yes! Join the Discord community! Q: How can I access The CoinOPS Project on Discord? Q: Which controllers are supported? 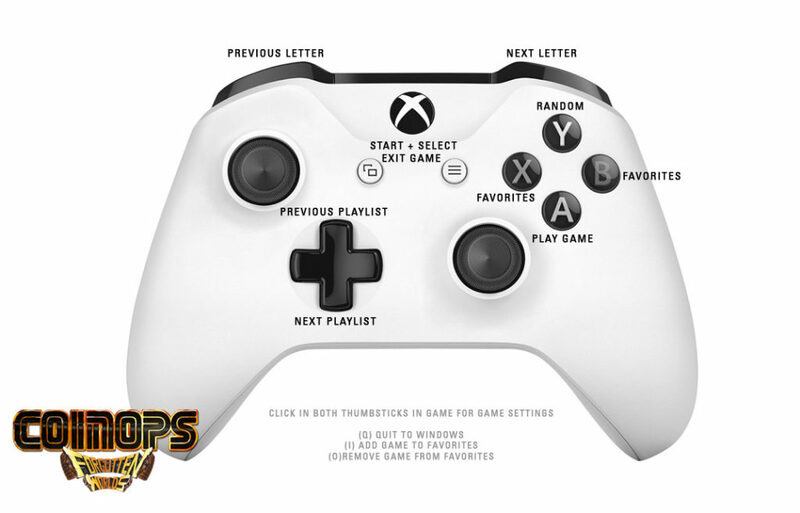 A: Basically any controller can be used, but by default this is pre-configured for XBOX 360/XBOX 1 controllers and standard MAME controls for 2 players. Q: Why can’t I change my default controls and have them saved? A: You will need to run ‘\Advanced Configs\- DEFAULT CONTROLS Unlocked.bat’ to do this. This is locked to stop MAME from removing mapping when no gamepads are plugged in. Q: How can I restore default controller mapping? A: Run ‘Restore Xbox Controllers.bat’. This will restore the controllers for Player 1 and Player 2 (Restore Defaults.bat also will do this and more). Q: How can I connect my PS3 controller and use it as an Xbox 360 Controller? Q: My USB controllers/light guns keep changing player order. How can I assign a controller to a player position? A: Here is documentation for MAME to use “stable controller IDs”. Q: How do I modify arcade cheats, default controls, game controls and other settings when playing games? A: For games running in MAME, click in the Left and Right thumbsticks at the same time or press TAB during game play. You can modify additional settings in MAME by opening \emulators\mame\mame.exe (or mame64.exe). Q: What are the default keys in CFW? How can I change them? A: Keys in CFW be changed by modifying controls.conf. Some of these change depending on the GUI skin you choose. Q: How do I change basic settings? A: In CoinOPS Forgotten Worlds Gems and Gems Plus, scroll past the top playlist (F1 on keyboard) or scroll past the bottom playlist (F2 on keyboard). There is a hidden settings playlist. You can run ‘\Advanced Configs\- SETTINGS Disable.bat’ to remove the Settings from CFW. Q: I have an older PC. How do I reduce game slowdown? ‘- LCD (4×3).bat’ or ‘- LCD.bat’ or ‘- Fastest Scanlines (4×3).bat’ or ‘- Fastest Scanlines.bat’. Q: How do I start CFW with the All Games playlist? A: You will need to run ‘\Advanced Configs\- START All Games.bat’ to do this. It is set to start in the Favorites playlist by default. Q: Can I use the 64 bit version of MAME? A: You will need to run ‘\Advanced Configs\- 64 bit MAME.bat’ to do this. It is defaulted to using the 32 bit version of MAME for better compatibility across PCs. Q: How do I reset all the settings back to default? ‘- Restore Xbox Controllers.bat’ – Restores controller settings back to defaults. ‘- Restore Defaults.bat’ – Restores Settings, Skin, Controllers, etc.. back to defaults. Q: How do I fine tune the look and feel of CFW?